Triple Vanilla Blondies – perfectly soft and chewy bars that are boasting of sweet vanilla flavor in ever bite! Who doesn’t love a delicious and incredibly easy dessert? 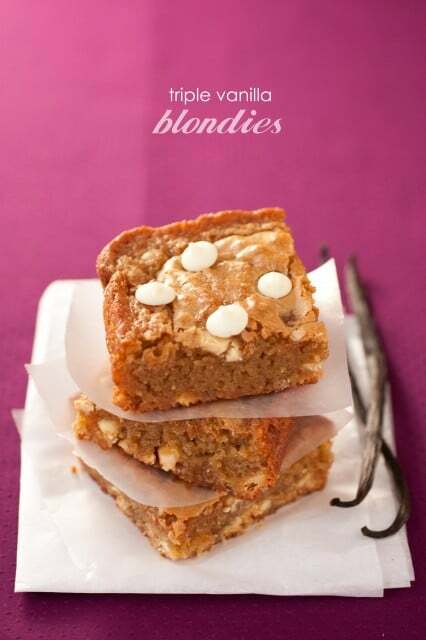 The better question is, who doesn’t love blondies? 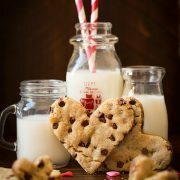 Their taste and texture is similar to chewy chocolate chip cookies, with all the butter and brown sugar they contain they may even have you thinking of caramel, and for the rare occasion when you just aren’t in the mood for chocolate – what comes next? Vanilla. I wanted to create a blondie that didn’t leave you wondering what the standout flavor was supposed to be so I made these as titled, Triple Vanilla Blondies, with vanilla flavor coming from three sources. They are layered with those incredible little vanilla bean seeds that pack a lot of sweet, natural flavor, along with a generous amount of vanilla extract (considering there is only 1 cup of flour), and they are finished of by folding in plenty of vanilla chips. These bars are dreamy. Hide them. Don’t let anyone know you made them. Fan out the kitchen and cover up their delightful brown sugar and vanilla scent, then serve everyone else some bakery item you picked up from the local grocer. No one needs to know and if they are on to you, just tell them they’ll have to make their own and things this good don’t come for free =). Enjoy! P.S. if you want to really indulge, serve these warm with vanilla bean ice cream (for even more vanilla flavor) and caramel sauce. 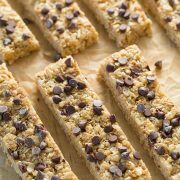 Perfectly soft and chewy bars that are boasting of sweet vanilla flavor in ever bite! Preheat oven to 350 degrees. Line an 8 by 8-inch baking dish with aluminum foil and brush with 1/2 tbsp melted butter, set aside (the foil isn't a must if you don't care to easily lift the bars out, you can just brush the butter right onto the baking dish). Melt 1/2 cup butter along with vanilla bean seeds in a medium saucepan over medium-low heat, stirring frequently. Once melted, remove from heat and stir in light-brown sugar. Allow mixture to cool for 5 minutes. Meanwhile, in a mixing bowl, whisk together flour, baking powder and salt, set aside. Once butter mixture has cooled slightly, using a wooden spoon, stir in eggs and vanilla extract. Add in dry ingredients and mix until combine. Fold in vanilla baking chips and pour mixture into prepared baking dish and spread into an even layer. Bake in preheated oven until top is golden and toothpick comes out clean, about 28 - 32 minutes. Allow to cool 5 - 10 minutes in baking sheet before using foil overhang to lift blondies from pan. 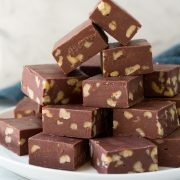 Cool completely on a wire rack then cut into squares, or serve warm with Vanilla Ice Cream and caramel sauce. Alaska Girl: Hello, Where do you typically buy the vanilla beans to get the vanilla seeds? How many seeds are in one vanilla bean? Can you tell I’ve never really bought them before? Actually I have, and then later thrown them out! My other question is this–I don’t much care for white chocolate chips. Most are made from hydrogenated oils and even the expensive ones in the grocery store seem so fake. After all, there is really no such thing as white chocolate, it’s a fabricated product. Anyway, could you recommend a substitution? Such as butterscotch chips? Yes, I know, they’re made up, too, but at least they’ve been around for 50 years and they are yummy. I just can’t cook with the white chocolate–would you recommend leaving it out entirely or subbing the butterscotch? Zoe Howarth: Hi, I’ve just baked these yesterday and although they taste great, the texture wasn’t what I expected. They are very cakey instead of a more denser brownie/blondie texture and which I can see in your photo. Do you have any ideas why this has happened? I’m in the UK so I had to convert all of the measurements (which wasn’t a problem btw) and I took them out of the oven at 20 mins, they seemed to be darker on top than yours.